Tuya’s Full-Chain Smart Product Value-added Services (VASs) plan helps partners expand global smart product services. Leveraging the powerful Tuya ecosystem, Tuya has created an innovative platform service model to build global competitiveness of smart products and provide full-chain services oriented to the international market. Tuya will provide high-quality functional and service solutions to help you enter the global smart product market, seize opportunities, and build comprehensive and global smart product competitiveness. Specify your Tuya account to log in to the Tuya Smart platform. If you do not have a Tuya account, click Sign Up to register for one. Click Value-added Services. The value-added services are classified into App Service, OEM Skill, Third-party Access, Data Service, Notification, Content Service, Marketing, and Customization. Select All Services and scroll down the page to search for your required service. Alternatively, click the service type label on the top of the page to quickly locate a service. (1) Create an app and set the app name and package name. (2) Configure app functions, including personalized functions, basic functions, network configuration, and other configurations. (3) Test the app. After you have completed the app configuration and created the app, scan the QR code to download the app and test it. (1) OEM app software upgrade and maintenance: Tuya provides one-stop OEM app version planning, iterative technology development, and post-maintenance services, allowing you to upgrade your app version and keep it competitive through simple operations on the Tuya Smart platform. 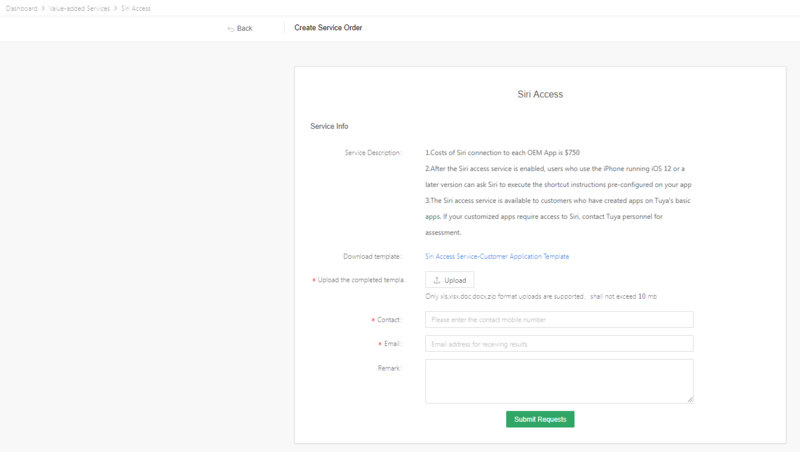 (2) Online version update: You can use the update package that Tuya sends to create a version of your OEM app online in a few steps. You may find that version updates have never been so quick and easy. (3) Continuous upgrade of app functions: As mobile phone operating systems are upgraded constantly and similar products emerge, continuous upgrade of app functions is an important means for you to maintain product competitiveness. Tuya’s service can help you quickly respond to product upgrade requirements and keep your app competitive. 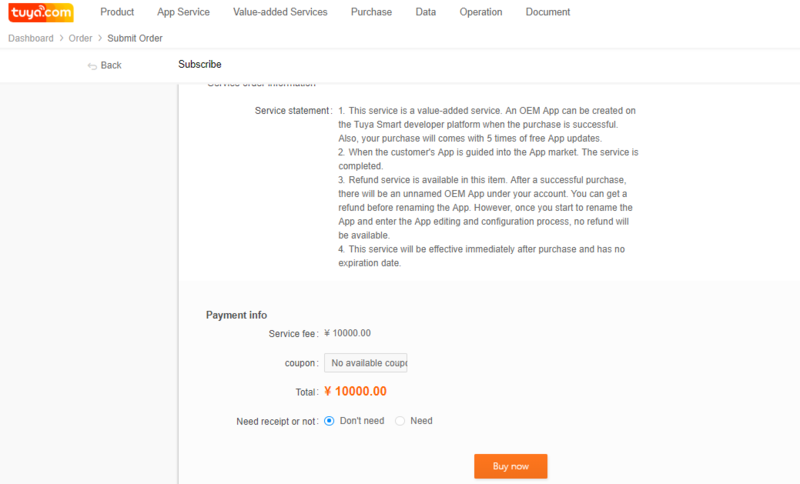 In the service validity period, Tuya provides 10 app version updates and post maintenance. (4) Comprehensive app optimization: Tuya continuously optimizes the interface design of your app for user-friendliness and stable connections. (2) Wait for Tuya’s approval. Tuya personnel will review and approve your application within one workday. (3) Pay for the order. Online payment methods such as Alipay and PayPal are supported. You are advised to use your company account for payment, because special value-added tax invoices cannot be issued if you use your personal account for payment. (4) Create an update package: Log in to the Tuya Smart platform, choose App Service > My App, and click the app to be updated. On the displayed page, apply for an update package as prompted. 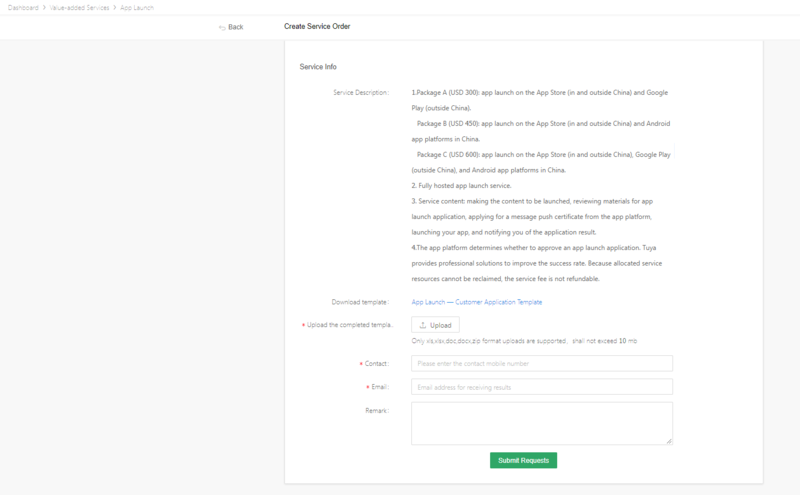 Tuya’s professional review engineers modify the app content and strategy in line with the review rules and real-time status of the target app platform. Based on the app functions, content, submitted materials, policy changes, and review phases, Tuya engineers can discover in advance the potential risk that an app may be rejected and take measures to improve the success rate. Currently, Tuya’s App Launch service applies only to the App Store (in and outside China) and Google Play (outside China). To launch your app onto other app platforms, contact Tuya customer service personnel. (2) Wait for Tuya’s approval. Tuya personnel will review your order and complete a quotation within one workday. (4) Send samples to Tuya for testing to ensure service quality and a good user experience. 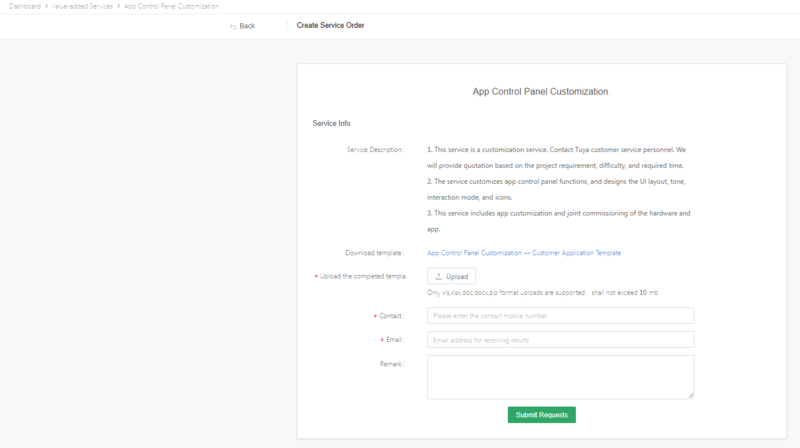 (5) Tuya will customize the control panel, and perform joint commissioning between the hardware and app to ensure an excellent user experience. (1) Submit information, including the app name, App Store developer account, and contact method of the owner. (3) Pay for the order. Online payment methods such as online banking, Alipay, and PayPal are supported. Quickly connects your OEM app to the widget. A widget is an app extension that can display shortcuts for devices or app scenarios in the iPhone Notification Center or on the home screen of Android smartphones. Widget access enabled for your app allows you to quickly switch on or off devices that are connected to your app on the home screen. You can also start or stop scenarios preset in the app to control multiple devices with one tap. This ensures a quicker and better user experience with your app. (4) Upon approval, Tuya will enable the service for your app and update your app version. You can then control smart devices through the widget with one tap. (5) Upon approval, Tuya will build your ordered skills. Tuya provides the Amazon Alexa Access service. (1) Submit information. Select the product that needs Amazon Alexa access and enter the remarks. (3) Pay for the order. Online payment methods such as Alipay and PayPal are supported. (5) Upon approval, Tuya will enable the voice control function for you. 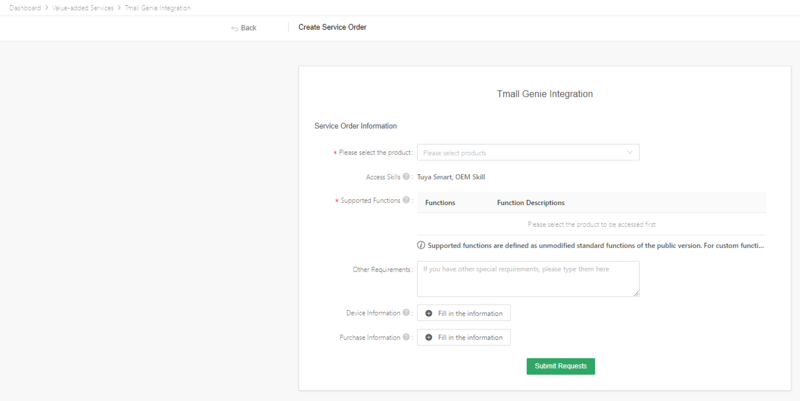 This service applies only to the smart products that use Tuya solutions and have been connected to Tuya Cloud. Only the functions that Alexa supports are usable. The voice control function can be used only in the languages and areas that Alexa supports. The products must have been produced for trial and have available devices. Allocated service resources cannot be reclaimed. Therefore, the service fee is not refundable. Tuya provides the Google Assistant Access service. (1) Submit information. Select the product that needs Google Assistant access and enter the remarks. Only the functions that Google Assistant supports are usable. The voice control function can be used only in the languages and areas that Google Assistant supports. Tuya provides the AliGenie Access service. (1) Submit information. Select the product that needs AliGenie access and enter the remarks. Only the functions that AliGenie supports are usable. The voice control function can be used only in the languages and areas that AliGenie supports. Tuya provides the Rokid Access service. (1) Submit information. Select the product that needs Rokid access and enter the remarks. Only the functions that Rokid supports are usable. The voice control function can be used only in the languages and areas that Rokid supports. Tuya provides the DuerOS Access service. (1) Submit information. Select the product that needs DuerOS access and enter the remarks. (4) Send samples to Tuya for testing to ensure service quality and user experience. Only the functions that DuerOS supports are usable. The voice control function can be used only in the languages and areas that DuerOS supports. Tuya provides the IFTTT Access service. (1) Submit information. Select the product that needs IFTTT access and enter the remarks. Only the functions that IFTTT supports are usable. Currently, the IFTTT platform only supports the English language. This service records and stores data of online activated devices. Device logs record device use in chronological order. 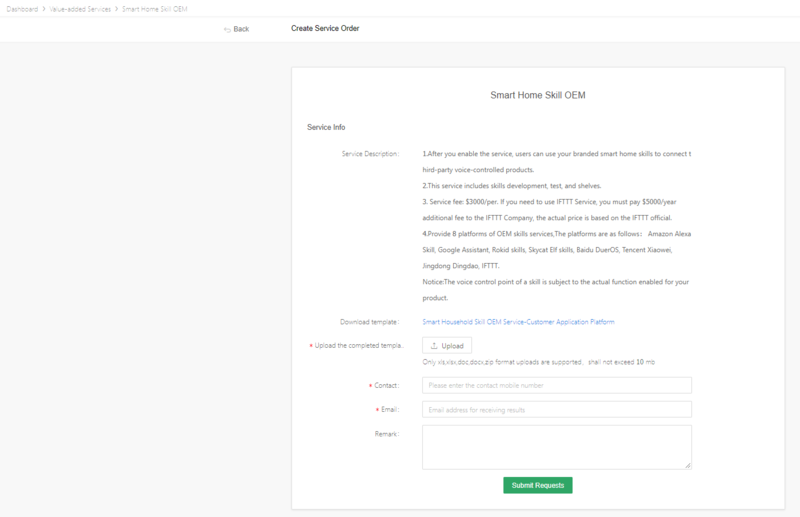 The Device Log Storage service stores the logs of online activated devices to the Tuya Smart data center and allows you to query the logs in real time if you enable the service. Log data can be used for multiple scenarios. For example, long-term log data can be used to draw indicator curves on the app control panel and log data analysis can help determine device fault warnings. (3) Upon approval, Tuya will enable the service for you at no charge. (4) Pay for the order. The Device Log Storage service is free during the public test phase, which expires on March 31, 2019. After March 31, 2019, the service fee will be deducted from your account balance monthly. Online payment methods such as Alipay and PayPal are supported. You are advised to use your company account for payment, because value-added tax invoices cannot be issued if you use your personal account for payment. The public test phase expires on March 31, 2019. During the public test phase, the service is free. After the public test phase expires, you need to pay to use the service. For details about the service fee standard, contact your business manager or Tuya customer service personnel. The service fee is deducted from your account balance monthly. If your account balance is insufficient, the service will become unavailable in one week. Log retrieval and parsing functions are being developed. The Device Log Storage service will extend data usage and analysis to support service development. Tuya provides the value-added service of cloud storage for smart camera videos. After you enable the service on the Tuya Smart platform, Tuya will enable cloud storage for videos of the smart cameras under your account. After end users subscribe to the value-added service, Tuya will periodically settle the revenue sharing with you. (3) Sign the contract online. The contract takes effect when your application is approved, and the service package is displayed. 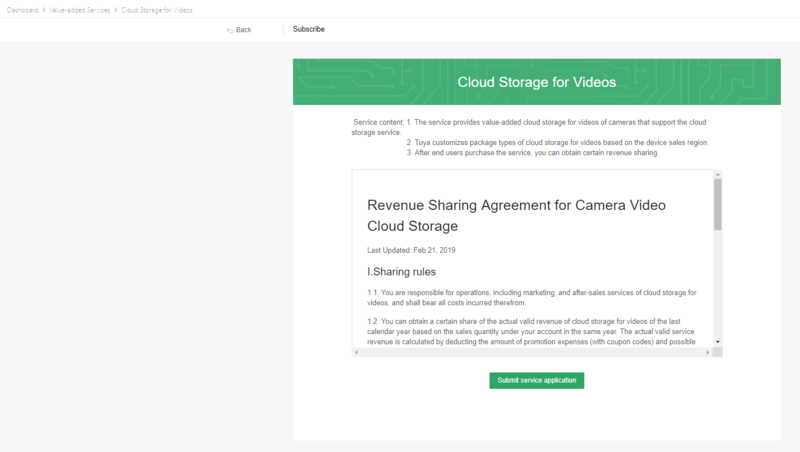 (4) Upon approval, Tuya will enable the cloud storage for videos function for you at no charge. (1) Your product and app use Tuya solutions. (2) Your smart cameras have video cloud storage capability. For details, contact your solution provider or supplier. Self-service configuration of a cloud storage package for videos is not supported. Tuya personnel will communicate with you and confirm the most suitable cloud storage package for your products, and configure a package for you. (2) Pay for the order. Online payment methods such as Alipay and PayPal are supported. You are advised to use your company account for payment, because special value-added tax invoices cannot be issued if you use your personal account for payment. (3) Send samples to Tuya for testing to ensure service quality and a good user experience. (4) Set a renewal reminder. 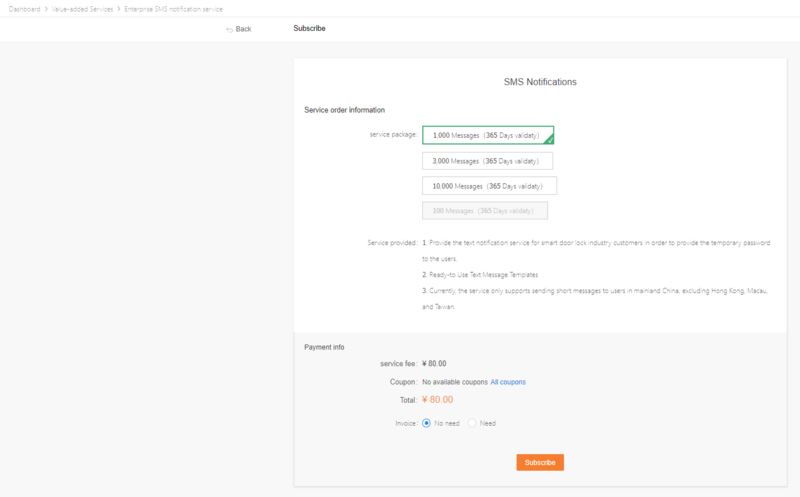 After enabling the service for the first time, configure the reminder function to notify you when you have just a few SMS messages remaining. The Cloud Recipe service enables manufacturers to manage recipes and provide automatic cooking services for consumers based on a preset cooking sequence and conditions. This service applies only to rice cookers, blenders, sous-vide machines, frying machines, and airfryers. 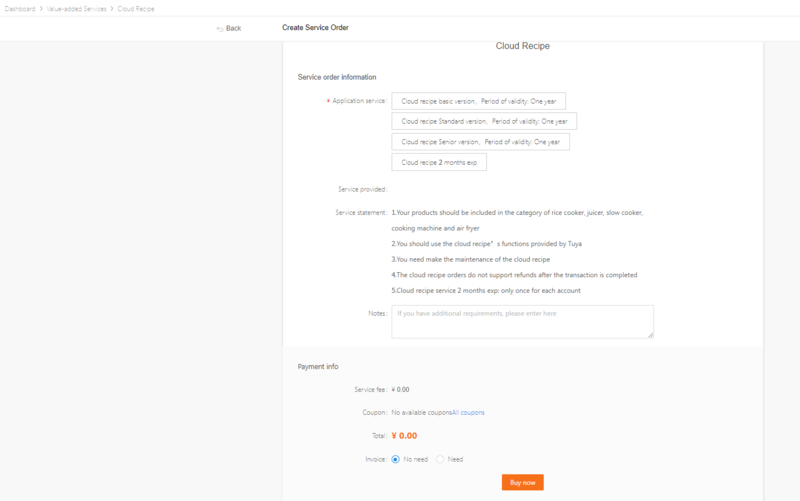 A basic version of the Cloud Recipe service has been released, including a cloud recipe management background with an exclusive domain name, binding to two products, and one-click startup. After you pay for the service, the cloud recipe management background is automatically enabled for you to manage recipes. There are no refunds. If you have any questions, contact your sales manager before you pay. The service validity period is one year from the purchase date and can be extended if you renew the service during the validity period. (1) Product photos with white background are the traffic entrances. (2) Segmentation PNG photos are provided. (3) The 5+3 mode provides a set of photos to meet multiple demands. (1) Submit details of materials according to your photography requirements. (4) Send samples to Tuya to ensure the quality of photos. (5) Tuya photography service providers take and finish product photos with a white background. (6) Review the sample phones that Tuya photography service providers send. Photography service content: After you place an order, Tuya personnel will review your order within one workday. Tuya photography service providers consider the service content specified in “White-Background Product Photography — Customer Application Template” as the final content of the photography service. The content cannot be modified after the photographic resources are allocated. Delivery time: If you place an order for photos of one to five products, Tuya photography service providers will deliver sample photos within six to eight workdays after receiving the samples. If your order involves more than five products, the delivery time is subject to Tuya photography service providers’ schedules. Tuya personnel will negotiate the delivery time with you and inform you of the specific delivery time within one workday. Photo color difference and brightness: Tuya photography service providers ensure real color reproduction through professional color correction and color modulation. The color may vary on displays of different models or with different color settings. This is normal. Tuya reserves the right to the final interpretation of color. Modification or photo retakes: Tuya photography service providers promise to modify photos one time for free in accordance with your reasonable suggestions. 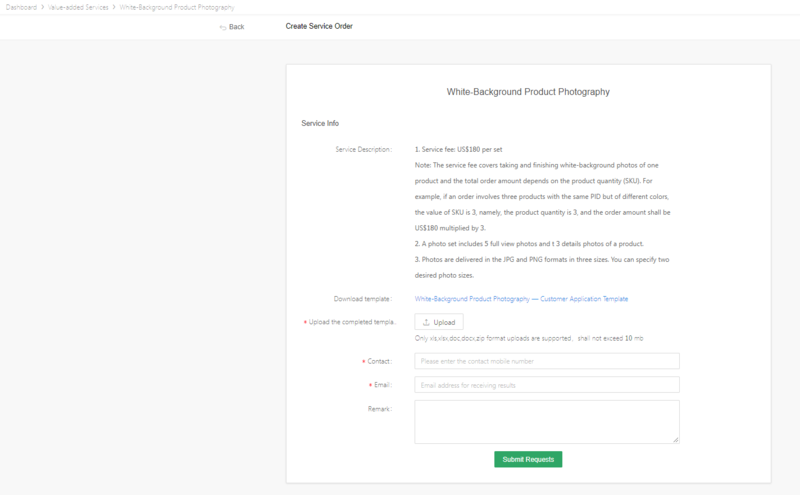 Enter the content to be modified in the Tuya provided “White-Background Product Photography — Modification” and send the document to Tuya. Tuya photography service providers will complete each of the modifications. For purely subjective reasons such as “I don’t like the photo” or “The photo is not elegant”, Tuya photography service providers will not modify the photos for free. If you require more photo modifications in addition to the free modification or retakes photos, you shall pay 50% of the total service fee for the extra service requirement. Pricing method: One service is to take and finish white-background photos of one product and deliver five global photos and three detailed photos from different angles in JPG and PNG formats. The order amount is calculated based on the product quantity. Products of the same model but different colors shall be charged separately. Postage: The service fee does not cover the product freight. After finishing the photos, Tuya will send your products by express delivery with freight payable on destination. (1) Marketing videos can efficiently show smart products. (2) Rooted in the IoT industry, Tuya helps you extract selling points with a high conversion rate. (3) Tuya provides efficient, high-quality, standard shooting. (1) Submit details of materials according to your shooting requirements. (5) Tuya video service providers shoot and post-process videos. (6) Review the sample videos that Tuya video service providers send. (7) Tuya video service providers deliver the finished videos to you. Shooting content: After you place an order, Tuya personnel will review your order within one workday. 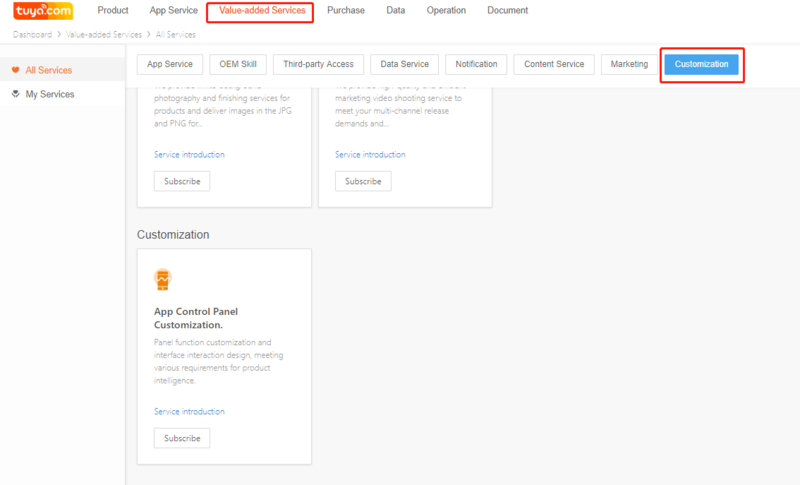 Tuya video service providers consider the video content specified in “Marketing Video Shooting Service — Customer Application Template” as the final content of the video service. The content cannot be modified after the video shooting resources are allocated. Color difference and brightness of video images: Tuya video service providers ensure real color reproduction through professional color correction and color modulation. The color may vary on displays of different models or with different color settings. This is normal. Tuya reserves the right to the final interpretation of color. Definition and background blurring: Tuya video service providers use mainstream professional equipment and provide finished videos in 1080P MP4 format to ensure high-definition video quality. In the shooting, the background may be blurred for composition. This is a shooting technique, which does not mean the video is unclear. Delivery time: If you place an order for a video of one to five products, Tuya video service providers will deliver sample videos within six to eight workdays after receiving the samples. If your order involves more than five products, the delivery time is subject to Tuya video service providers’ schedules. Tuya personnel will negotiate the delivery time with you and inform you of the specific delivery time within one workday. Modification or video reshooting: Tuya video service providers promise to modify videos one time for free in accordance with your reasonable suggestions. 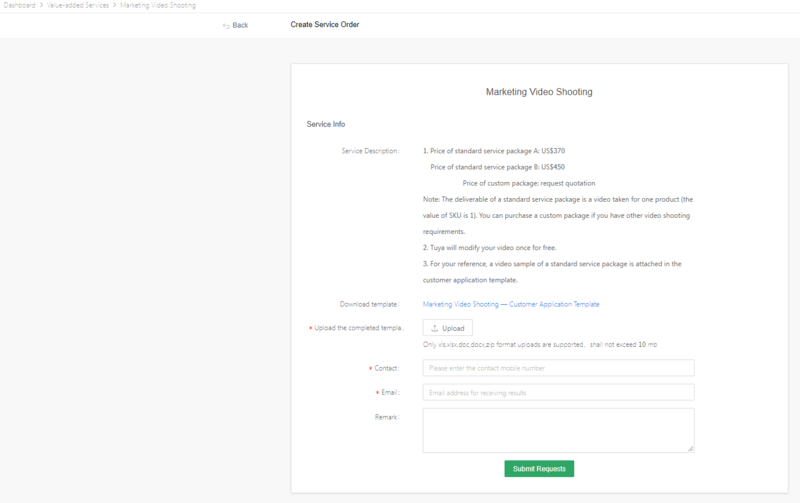 Enter the content to be modified in “Marketing Video Shooting — Modification” provided by Tuya and send the document to Tuya. Tuya video service providers will complete each of the modifications. For purely subjective reasons such as “I don’t like the photo” or “The photo is not elegant”, Tuya video service providers will not modify the videos for free. If you require more video modifications in addition to the free modification or reshooting the video, you shall pay 50% of the total service fee for the extra service requirement. Postage: The service fee does not cover the product freight. After finishing the video, Tuya will send your products by express delivery with freight payable on destination. (1) An app is the control center of a smart device, and the app’s control panel is used to display and execute product functions. The panel allows you to control specific smart device functions remotely. Beautiful UIs, diversified interaction models, and various control functions enhance user experience of smart devices. (2) Panel function customization improves product competitiveness. Tuya customizes control functions exclusively for your intelligent hardware to meet diversified product function requirements. (3) Highly efficient design ensures an excellent user experience. A professional design team with extensive design experience designs smart device usage scenarios and interaction models that comply with the use logic and meet user needs. The efficient customization of the app control panel layout, color, interaction mode, and icons ensures an excellent user experience with your app. (4) Tuya has powerful platform development capabilities to develop the app control panel within a short time. As an industry development standard setter, Tuya also provides comprehensive support services to promote smart device interconnection. (2) Wait for Tuya’s approval. Tuya personnel will review your order and complete a quotation within two workdays. (1) High efficiency: The control panel can be customized within a short time. (2) Exclusive service: Remote control functions are customized for your smart devices, and one-to-one services are provided. (3) High quality: The Tuya Smart platform provides strong development capabilities to empower enterprise customers at one stop, enhancing integrated product capabilities. (4) Excellent user experience: The service covers the whole process, including control panel function customization, UI design, and joint commissioning between the hardware and app.